Infusing is not going very well for my "Christian" right now. He is fighting so hard because of his fear of needles and his father and I just cannot access him without help. We have a plan in place. We will be going to the HTC on Wednesday afternoons after school to have the nurse access him, while the Childlife Specialist works with him before the actual infusion. Unfortunately it takes several people to hold him for the infusion, but there is no other way right now. At least it takes his father and I out of the picture for a bit and our stress levels can go down as someone else is infusing Christian. We also have an appointment scheduled for him Tuesday evening to see a therpist who specializes in play therapy. I have no idea what to expect, but right now I will try anything. Have you had any experience with play therapy? "Christian" has been doing well. His ankle has recovered from the last bleed and he is running around being a typical six year old boy. This afternoon, while at the harvest festival at church, Christian was playing with one of his friends. As I sat back and watched, I realized how he has adjusted. He runs as fast as he can with his brace to keep up doing little boy things, but you can really see how his ankle has endured damaged from repeated bleeds. He has a funny little hop in his gait. But it sure doesn't stop him. It still just breaks my heart. He doesn't know any different, but one day he will. Wednesday night was one of the worst nights of my life. My "Christian" came into the hospital due to an ankle bleed on Tuesday. We could not control his pain at home. His ankle bleeds are notoriously painful….just off the charts. A morphine pump had to be used and he could just get comfortable. His pain was unbearable. Long story short, it was too much. He got into the kind of deep sleep that children going into surgery get into. He would not wake up. I kept rubbing his legs and arms and kept wiping his face with a wet cloth. I was out of my mind! The room was filled with doctors and nurses working to get him to wake up and they gave him medicine to reverse the morphine. It was so painful to watch him come off the morphine. For a moment, which seemed like an eternity, I thought he would not wake up. What would I do if he did not wake up? It was the worst feeling of my life. You think you know what hemophilia is all about. 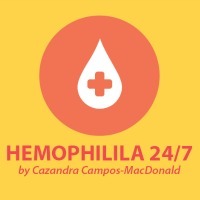 The bleeds, the infusing, talking to the school nurse constantly, having boxes and boxes of supplies...enough to open a small pharmacy...and you get so enveloped into the hemophilia that you don't think that something else could happen. Years ago some friends of ours, with a 2 year old son who had severe hemophilia, died from choking. Choking. Their lives were so immersed into the bleeding disorder that nothing else ever crossed their minds and it was devastating. I'm not saying we should worry about living, but when you have a wake up call like I did, it reminds you to not take things for granted. Build Legos, snuggle and watch a movies, take their hand and follow them to their room to play. We never know when our last day will be, so let's make the most of each and every moment. My "Christian" has been in the hospital since Tuesday and in huge amounts of pain. He has been screaming in pain "My ankle, my ankle!" He's now on a pump with continuous morphine flowing and he still cries out in pain. The measurement of his ankle has gone up instead of down and I am extremely concerned. We are waiting on his inhibitor results to come back in and I am at a loss. I don't even know what to think. 4 mgs of Novoseven are being infused every two hours. I was hoping to see things at least stabilize by now. Fortunately many people do not know what it is like to see their child in extreme physical pain. Even when it happens time after time it's something that does not get easier. You never get used to the painful screams, seeing your child constantly scratching themselves raw from the pain meds, the anxiety that develops when they have topped out at the amount of pain meds they can receive...monitors, oxygen....it's just not convenient when you are a six year old. I truly thought my "Christian" had turned the corner on his fear of needles. We've taken a few steps back. I completely lost it with him last night when he did not cooperate...not one of my better parenting moments, and when our homecare nurse came today it was a huge fight to access. The good thing is that he is accessed for the week. This morning I went on the early school run and took "Lance" to school. When I returned, my husband was sitting on the stairs, a pool of blood drops at his feet and Christian was in tears. He tripped going up the stairs. Yes, going up the stairs. If the gash had been any larger, I think we would have been off to the hospital. Things have been going so well for such a long time for my Christian and the minute I get complacent...something happens. Just a little reminder that hemophilia is always with us...stumped toes and all. It's amazing what can happen in just a few minutes. "Christian" is starting Cellcept tomorrow. He was on it for a brief time with no problems, but the issue was that the doctor who started him on the treatment left the HTC and we never were able to see the result of a full run of the medication. We are hoping that this helps his inhibitor come down. It's currently at 28. It sure would be nice to start Immune Tolerance. When I started to think about all that my Christian has gone through with his inhibitor, it's kind of overwhelming. He was diagnosed at 11 months and he is now 6 1/2 years old. The disheartening part is that I have heard of people living with an active inhibitor for years upon years. You just never know how long it will take to tolerize (or even get to the point where you can try to tolerize). I am just so grateful that things have been calm for these past couple of months. It's been quite a respite for the entire family. More about Cellcept to come. Our trip last week to the Denver HTC was great. They really do it right over there. Dr. Manco-Johnson and her team are absolutely top notch. Yesterday I received the call....inhibitor results. It's 28. ARGH! I had a feeling it was lower....not sure why, but I really thought it was down. I know, it's not about the number. but the treatment and most importantly the person being treated. But still...I wanted that number down so we could begin Immune Tolerance. We are getting closer. The reality is that this inhibitor may be around for quite some time. "Christian" was diagnosed with his inhibitor when he was 11 months old and he is now 6. 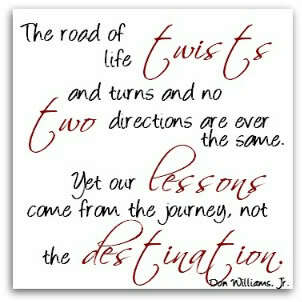 It's been a long, difficult time, but I am grateful that things are going as well as they are right now. You never know what the next day will hold....bleeding disorder or not. My "Christian" did a super job infusing Friday! He sat still and did not cry and wiggle :) He was so proud of himself. I am looking forward to our trip to the Denver HTC this week. We'll have a great check up, get his inhibitor level tested and get his brace adjusted. Hope you are finding ways to incorporate your bleeding disorder into your life and not let it control you. Easier said than done....but very possible. We just returned from the Inhibitor Summit in San Diego, California. We had a great time :) We made some new friends, heard a few very useful nuggets of information regarding hemophilia and inhibitors and even had an "ah-ha" moment regarding "Christian's bad ankle. Arthritis maybe…..? I have a long list of questions/comments to take to our next HTC visit in a couple of weeks. "Christian" loved "hotel school" (the childcare program) and "Lance" was able to network with young men and women his own age and talk openly about hemophilia. It was time well spent (and we even had some time to play). I hope it wasn't a fluke, but my "Christian" sat completely still during his infusion on Monday! We had the iPad set up, he was playing, the Emla had been on for an hour and he was completely distracted. He said, "It didn't hurt!" Last night "Christian" and I were on my bed having a tickle fest. All of a sudden he rolled off the bed and on his way down, hit the corner of my glass topped nightstand right between his temple and eye. I shot straight up, grabbed him and knew infusing was top priority. My husband was unreachable, so I knew I had to access Christian's port....alone. Thankfully, big brother "Lance" was close to help Christian stay straight up in his seat. We had a pretty successful infusion. I had to maneuver the huber needle a bit, and hit bottom! It was a great feeling to take control of infusing again. I've let myself get out of the habit of infusing and have let my husband be the major "infuser" and boy was that a mistake. Simply because I became complacent. I was losing my skills and my nerve. Today Christian developed a headache, so off to the emergency room we went to get a CT scan. Thankfully all was clear. He is acting like his 6 year old self :) Accidents happen. When you least expect it. It's amazing that sometimes it takes a good jolt to knock you out of complacency. Fortunately all is well. Are you becoming complacent with your child's bleeding disorder? What can you do to reel it back in? Well, my son is just absolutely terrified of needles. The visit with the nurse from our homecare did not go any better than when it's just me and his Dad. To say he completely freaks out is an understatement. We just don't know what to do to help him calm down during his infusions. I think it is an effect from his numerous hospitalizations and the times he has been held down to find veins for IV's. It been extremely rough for him...things are better now, despite his inhibitor, but you just can't erase those experiences. Any suggestions on how to calm a child's fear of infusing? I'll try anything. When you live in a rural area with little or no resources to back you up when living with a bleeding disorder, you handle things on your own and hope you don't have to make the 2 hour drive to the HTC very often. Now that we are living in the big city (and not "on the prarie") we are 15 miles from the HTC and our main home care nurse lives about a mile away from our new home. I recently took "Christian" in to the HTC so they could check out his port. It was pretty bruised up and he was complaining. I mean, it only took me about 20 minutes to get there, so why not have him looked at. When the nurse accessed his port, she and the HTC nurse asked me, "Does he fight like this every time you access?" I answered, "Yes. We just have to make it work." That's when I realized that we needed some help. We have scheduled our home care nurse to come in to help us access for awhile. We access Christian once a week and infuse him daily. He is on daily NovoSeven and he is just horribly afraid of needles. I took him in to work with "Chester Chest" at the infusion office and he worked with our wonderful nurse. They talked about ports, touched and even accessed Chester's port. Christian even practiced how he was going to sit when she come to help us infuse. We'll see how it goes on Monday. Waking up with bloody sheets and pillows always looks worse than it is, but it's still not fun. Fortunately, "Christian" is good about taking his Amicar and what really helps to control the bleeding are tea bags. We do a quick soak of a small tea bag and put it in his mouth over the affected tooth and have him gently bite down. The taste is not great, but he knows it helps. What helps you control those nasty mouth bleeds? My 15 year old, "Lance", has been very fortunate in his journey with Severe Hemophilia. He has never had a joint bleed, and has really only had one severe muscle bleed….ever. He had a low titer inhibitor, one port placed and was immune tolerized within 2 1/2 years. The port never had an infection. He had an appendectomy and came through without any problems. A walk in the park compared to most. That is why it is so hard to get him to understand the importance of infusing three times a week. Last night he showed me an area on his upper thigh...a horrible bruise near his groin and it scared me. That's when I went off on him about the importance of infusing. The problem (a good problem) for kids like Lance is that their treatment has been so good and so many bleeds have been avoided, that they do not know what it is truly like to have pain from a bleed (or maybe even know when a bleed is occurring). Even though Lance has seen his little brother go through hours upon hours of severe pain from a bleed, it just does not register that it could happen to him. All I can continue to do, before he leaves the nest, is try to instill in him the importance of his treatment. Once he is on his own, there is not much I will be able to do, but until then, I'll keep on hounding him about ordering his product and treating. We caught a bleed just in time. "Christian" had another bleed into his right knee....that makes me nervous. The last thing he needs is another target joint. We are learning that the minute Christian makes the slightest complaint, we need to infuse. Fortunately he was only in his wheelchair for a couple of days. He managed himself well at school (it was the first time he has actually gone to school in his wheelchair). The one tool we have that we rely on heavily is our tape measure. It truly helps us to keep an eye on how a bleed is progressing. The important thing to remember is to mark the place you are measuring to be as accurate as possible. 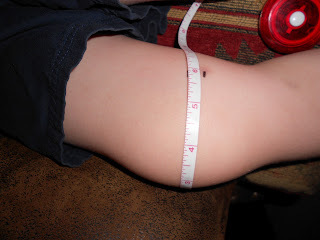 I never understood why tape measures were so helpful, but when you have a child with joint issues, you learn quickly. (The picture of this bleed kept Christian in the hospital for several days a few weeks ago). "Christian's" right knee is finally on the mend :) He is moving it around without crying in pain and can straighten it more that it had been previously. I hate when my son has to be confined to bed. You do everything you can to help them pass the time, and when they don't even try to get out of bed, you know they are hurting. I am hoping he gets discharged over the weekend and back to school on Monday (probably with the wheelchair). Measuring the knee has really helped us monitor the progress of the bleed. One of our nurses even measured his "muscles" which have been recorded on the board as "huge" and "enormous"! The nurses here at the University of New Mexico are just fantastic! "Christian" had been complaining of pain in his knee for severral days. Last Friday we infused per our bleed protocol and over the weekend, all seemed well...until Monday. We infused per a bleed again, I went to the school to give a second dose and ended up bringing him home. His knee was swelling and he was limping. After an afternoon on the sofa the knee was looking better, until around 6 pm when it just seemed to "blow up". He has never had a knee bleed before and it looks awful. Just like the photos you see from Laurie Kelley or the NHF. We came into the hospital last night and he has rested comfortably since around 2 am (with the help of morphine for the pain). I've no idea what the day is going to bring, but I am grateful to be at the hospital this morning. My "Christian" and I are in the infusion suite gettin an infusion of IVIG. Hie immune system needed a little boost, so we will be out in a few hours. As Christan says, "easy peasy lemon squeezie". I really feel like the brace we had made in Denver has made a huge difference for Christian. So far, no ankle bleeds. I really think it's giving him the support he needs to keep everything in the right place. Daily infusions are going well, but he is a bit bruised up right now. His teacher called me, told me he wasn't himself and she was a little worried. See, my Christian is a "social butterfly" so for him to be withdrawn is a pretty big thing. By the time my husband and I got to the school, things were a little better. It did my heart good to see him break into a great big smile when we walked in the door. To know you are not alone. When I got the call from school that "Christian's" ankle was bothering him after recess, I immediately went and infused him. It was the end of the day, so I brought him home early. The HTC recommended dosing with Novo every 2 hours. Normally, between me and the hubs, this would work, but hubby has been extremely sick. Dosing every 2 hours alone makes for a very tired Mommy. The next morning, I called the HTC and told them I would like for someone to take a looksie because I really did not want a repeat of the most awful bleed of all time from this past November. We have been admitted, lots of NovoSeven and Christian is doing great! We seemed to get ahead of this bleed and nipped it in the bud early. The New Year has started rather quietly where hemophilia is concerned. So far, so good. We are trying to get to Denver to pick up "Christian's" brace. I hope within the next two weeks we can get there.